Jicama is a root vegetable from Central and South America. Many people call it the "Mexican Potato." The inner consistency is like a mix between a white potato and a pear. It's a bit on the sweet side and can be used in hot or cold dishes. Only the inner "meat" of the jicama is edible. The vine and seeds are actually poisonous! 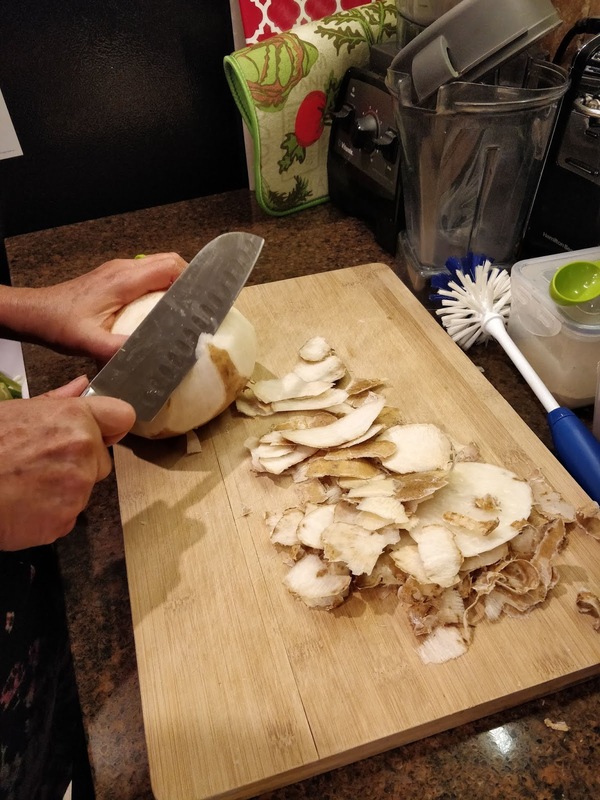 Jicama is loaded with vitamins, minerals, phytonutrients, and other organic compounds, including dietary fiber, vitamin C, vitamin E, folate, vitamin B6, pantothenic acid, potassium, magnesium, manganese, copper, iron, and a small amount of protein. Since there is an especially large amount of vitamin C in jicama, it is helpful in boosting the immune system when eaten regularly. Plus, there are several other health benefits that can be researched by a simple Google search. 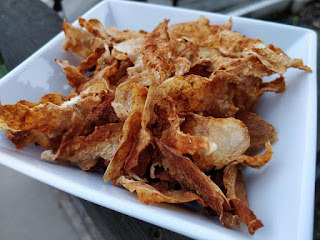 A while back, I had the pleasure of tasting a packaged jicama chip, but I wasn't thrilled with the fact that even though they were baked and not fried, they still had some oil in them. So, I decided to make my own at home! First, I made the seasoning for the chips. The ones I had in the package were BBQ flavored, so this is what I came up with, and it's delicious! Then, I sliced the outside "rind" off of the jicama with a sharp knife. I used a mandolin slicer to create uniform, thin slices. I placed the slices on a parchment paper-lined baking sheet. I put the seasoning into an empty spice jar (with a shaker top) and shook the seasoning onto the slices. After that, I preheated the oven to 350 degrees. It will be trial and error to get the chips crispy without burning them. KEEP YOUR EYE ON THEM! I recommend keeping the oven lower for most of the time to dry out the chips and raise the heat just a bit to crisp them up at the end. Count on anywhere from 20-30 minutes of cooking time. Just make sure the chips are fully crispy before storing them in an airtight container. Or, eat them all with your family in one sitting! :-) A large jicama (1200 grams) contains only 456 calories!